So what is it about Lie-Nielsen planes that ISN’T Earth “shattering”? Many of you know the designs we pattern our Lie-Nielsen planes after are primarily the Stanley Bedrock series. The originals were made well and were easier to adjust than most others at the time. When customers either stop by our showroom or one of our events, many will, at the minimum, pick up and check out some of our planes. It’s relatively easy to compare the majority of features, from the thickness of both our cutting irons and plane bodies to the level of fit and finish. But not surprisingly, there are probably aspects of design that go unnoticed. 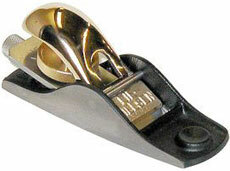 Most customers who own, or have used an old Stanley, will notice how much heavier our planes are compared to the Stanley brethren. This is due to the difference in the thickness of the castings. Besides being thicker, one of the critical aspects is the material we use for the body of our planes (except for those made of bronze). We use a ductile cast iron. What is this material and how does this compare to the old Stanley planes, as well as other plane makers? Ductile cast iron is a cast iron that has added materials that incorporate with the original materials and provide the ability for flexibility and elasticity, versus the tendency to shatter. Basically, the graphite in ductile cast iron is in the shape of spherical nodules rather than the flakes one would find in grey iron. The spherical nodules can slip past each other more easily, allowing for this flexibility. Designing the perfect blend was accomplished by spending a great deal of time via trial and error. Ultimately, the goal, which we achieved, was to make our Lie-Nielsen plane bodies so they would withstand the stresses the everyday woodworker would apply, and beyond. While I wouldn’t want to do this to my personal planes, our ductile cast iron plane bodies can withstand a drop from 15 feet, without shattering. There will likely be a bent corner, or something similar, but no shattering. If you would like to know, rather see what happens when similar forces are brought to bear on a plane body using the old cast iron, take a look at the video created by Popular Woodworking Editor Christopher Schwarz. This is assuming you don’t want to destroy an old plane in your own collection. (Besides, it is a bit dangerous, with the flying shrapnel!) I still feel like I ought to at least wear safety glasses while watching this video. Skew Chisel Class: Conquering my Fear Woodturning Newsletter: The Highland Woodturner is NOW AVAILABLE!